in all those kiddie stories. and received lots of Wolf Love. to also get a large wolf. before adding one to the family. for those who meet the requirements. but if you call them you can arrange a weekend visit. remember that breeders sell animals to make money. the animals once you pay for them. Additionally, breeding stock is often kept in horrendous conditions. That is why we only adopt our pets. Adoptables are not always problem animals. You can find pure breeds. to help support these wolves. I can attest to the quality of care they receive. They sure are beautiful! They look docile here. My future daughter-in-law has family who has wolves as pets (2 of them). I haven't "met" them in person yet. I have to admit...it kinda scares me. But they truly are gorgeous creatures and you've captured them beautifully. What beautiful animals. Wolf hybrids have become a problem in Oregon. People think it's going to be cool to own a wolf, but these guys are not just dogs. They grow to be huge and need an insane amount of exercise and a ton of room. They're escape artists who howl in the night, and are not safe around kids. Rescue groups can't handle them & there is not enough room in the wolf rescue properties to meet the demand. I can't believe it's legal to breed them, but it is. Thank heavens for places like this farm that take on the responsibility as much as possible. They are really beautiful animals! How nice to be so up close and personal with them... Many canines, including the more domesticated ones don't belong in families with small children. People really need to think their decisions through before adding any pet into their home and that way less animals end up turned in to Animal Control Centers across our country. A pet is for life. They are stunningly beautiful animals. These pictures are BEAUTIFUL! Such exquisite eyes. We have seen a few wolves here in Wisconsin in the past few years. I cannot imagine adopting one, but both of our dogs are adopted and very much loved. I agree about adopting. You can adopt almost anything. Beautiful photos, beautiful animals! You captured these majestic creatures beautifully. My daughter has always had a special love for wolves, not to own, but to enjoy in the wild. I will have to show her your post. What a great story with happy endings! I never thought of having one for a pet, of sorts. They are beautiful animals. We were told, they need at least another large dog with them since they are pack minded. They are beautiful, but they are not pets!! Boom & Gary of the Vermilon River, Canada. 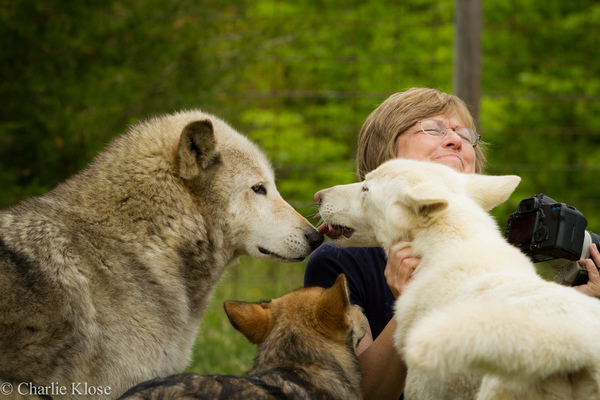 Wow - they are beautiful - and I had no idea people actually adopted wolves as pets. I guess they do get a bad rap. These are really beautiful captures! Wow! That's amazing. What a great experience for you. I love all the pictures. Such beautiful creatures. The bad looks good :) Awesome shots! We are not allowed to adopt wolves were I live up North. shot by who knows who. I think one of the wolve was the mother in the pack. They got in the two as they never left the area. I know at night in the winter I used to hear them howl at night. Bad scene at the Wolve place in Haliburton. I guess if you write in your browser Wolve Place Haliburton ontario. You may get feed back. Not seeing about the tragedy. There is an update . On the side bar . Very faint but you can read it. The sighting in Feb 18th I think. There is 3,4,5 and then update. Seeing your a wolve lover this may be of interest to you. I have been twice to the wolve center as I live up North all year round as we are retired.